A horizontal machining centre (HMC) designed specifically so that it can be expanded easily and inexpensively in the field has eased the growing pains of Adaero, a subcontractor in Crediton whose success in recent years means that its factory is bursting at the seams. The company invested £600,000 in capital plant during 2015 alone. Installed in October 2015, the 4-axis HMC is an Akari HS-450i high specification, twin-pallet model with a 120-position, chain-type tool magazine. Supplied by UK agent Whitehouse Machine Tools, the 640 x 610 x 680 mm capacity machine will be retrofitted in the coming months with a six-pallet pool and a 100-tool extension to the magazine. Normally, a manufacturer would take advantage of this expandability by installing the entry-level configuration while it develops its customer base and increases the level of business, then adding the cell extensions when production throughput had grown to an appropriate level. In Adaero’s case, the company already had the work, but it could not fit the 6-APC machine onto its 7,600 sq ft shop floor. The company has now rented an additional, 7,500 sq ft factory unit a few hundred yards away and plans to relocate a number of machine tools in the coming months. Jack Wilson, Operations Manager at the Crediton works said, “For some years we have adopted a policy of automating as much production as possible. 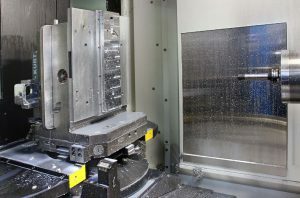 “In 2009 we installed our first multi-pallet cell, a 40-taper, 4-axis horizontal machining centre with 15 pallets and dedicated fixturing for the production of a specific part. “A couple of years ago, we bought the latest of many Brother vertical machining centres from Whitehouse Machine Tools, a 30-taper, 5-axis model. It was equipped with a System 3R automated, multi-level storage and retrieval system with 84 pallets carrying vices for securing a wide variety of components. Another horizontal spindle machine was required due to the type of work destined for it, which involves extensive machining of deep pockets in mainly aluminium and some brass. Efficient swarf removal under gravity is a considerable advantage, as is the ability to use current fixtures and programs. Several HMC alternatives were considered from a number of potential sources, including the supplier of the previously installed 15-pallet cell. Either the footprint was too large or the cost too high. The Akari offered the ideal combination of being economically priced and able to be expanded when space becomes available. Built in Taiwan by Averex, a specialist manufacturer established specifically to build only high speed HMCs, the 12-tonne machine incorporates top quality components. They include single-piece FCD600 castings for the spindle and pallets, Tsubaki ball screws, THK heavy duty roller guideways, a Tsudakoma rotary table, a high torque, temperature controlled Fanuc spindle motor with BIG Plus 40-taper tool interface, Kosmek tapered cones on the automatic pallet changer and a Fanuc 31i NANO control. Other facets of the machine build that found favour at Adaero included thermal management of the base casting, ballscrew nuts, thrust bearings,Y-axis servo mounting and spindle cartridge. The machine also boasts hand scraped surfaces for mounting the ballscrew bearing blocks and roller bearing slideways. An air/ oil mist system delivers precise, pressurised lubrication to the ballscrews, roller guideways and spindle bearings, reducing thermal growth and promoting high accuracy and repeatability. 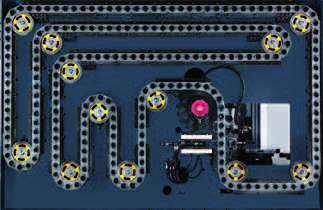 Another notable feature is the swarf management system, which is ideal for the subcontract environment. The twin conveyor, comprising both scraper and hinge belt systems, has advanced filtration that allows it to separate particles above 150 microns while handling copious amounts of coolant. Adaero produces components for a number of different industry sectors from a range of materials including aluminum, plastic, stainless steel, bronze and brass and all types of swarf are handled efficiently. Mr Wilson continued, “The HS-450i is a fast machine, with a 15,000 rpm / 22 kW direct drive spindle and 1g acceleration to 60 m/min cutting feed rate. Tool change is completed in one second, or three seconds when exchanging our Renishaw probe for workpiece setup or the Marposs tool setting probe. Gary Raymont, Adaero’s Managing Director added, “Ours is a high precision, high mix production environment involving machining of a few thousand different prismatic parts. “Quantities can vary from small prototype batches to high volume production runs. Working alongside our customers, we also offer a hybrid Kanban continuous manufacturing process using the latest production scheduling systems. “Customers are constantly demanding that prices be held or reduced while quality is maintained or increased, which means that we have to be a part of their design teams to engineer out cost and improve methods of manufacture.